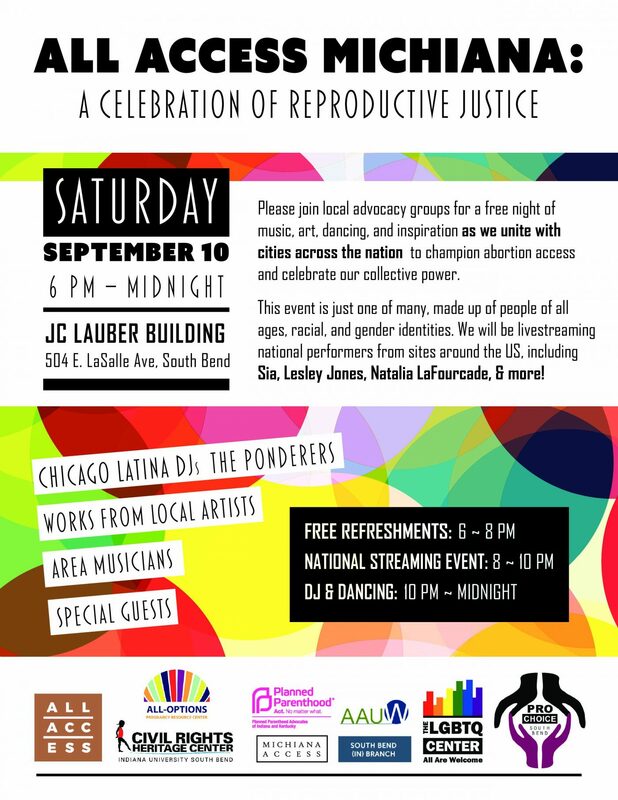 The Ponderers were invited to play at All Access Michiana next Saturday, September 10, where abortion rights supporters across the nation will gather in over 30 cities, including South Bend, committing to making abortion access a reality while celebrating in collective power. National livestreaming from the Cleveland Wolstein Center includes performances by Natalia Lafourcade and Sia. On Saturday, September 10th, 2016, abortion rights supporters across the nation will gather in over 30 cities including South Bend to commit to a path forward for our country that respects, uplifts, and empowers us all. Supporters in Michiana at All Access Michiana will enjoy a free event night of music, art, dancing, and inspiration. Doors open at 6pm with a mixer featuring live local performers, tasty eats, cold drinks, engaging art, and stimulating conversation. National livestreaming from the Cleveland Wolstein Center starts at 8pm and is headlined by Grammy-nominated artist Sia; stand-up Saturday Night Live cast member and Ghostbusters star Leslie Jones; and Grammy award-winning singer Natalia Lafourcade, with Comedy Central’s Jessica Williams as the host. The party’s just getting started at 10pm when Latina DJ duo The Ponderers take the local stage to keep the dancing going until midnight. Join us in making abortion access a reality and celebrate our collective power. All Access is made possible by the collaboration of organizations working for reproductive health, rights and justice. All Access Michiana is supported by Pro Choice South Bend, Civil Rights Heritage Center, LGBTQ Center, Planned Parenthood of Indiana and Kentucky, Michiana Access, American Association of University Women, and All-Options Pregnancy Resource Center. What: All Access Michiana, a free night of music, art, dancing, and inspiration.